GROS ISLET, St Lucia, CMC – Jamaica further strengthened their playoff chances when they easily brushed aside a struggling Guyana in the opening game of the St Lucia leg of the Caribbean Twenty20 here this evening. GROS ISLET, St. Lucia, CMC- The man who has been spearheading the preparation of pitch and field at the Beausejour cricket ground for the crucial second leg of the Caribbean T20 Tournament says he is expecting better batting performances. GROS ISLET, St.Lucia, CMC- The West Indies Cricket Board (WICB) has confirmed that a day’s play was sold out in advance for the first time in the history of West Indies cricket. (WICB) St John’s, Antigua – Starting on Tuesday, January 15, legendary former West Indies, Leeward Islands and Antiguan fast bowler Curtly Ambrose will join the Windies Cricket Radio commentary panel for the St Lucia leg of the Caribbean Twenty20. 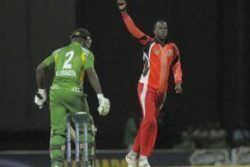 PORT-OF-SPAIN, Trinidad, CMC- All-rounder Kevon Cooper will miss Trinidad and Tobago’s remaining matches in the Caribbean T20 tournament due to professional commitments overseas. Gros Islet, St Lucia – At the end of the action-packed first phase of the Caribbean T20 at Queens Park Oval, defending champions Trinidad and Tobago lead the points table. 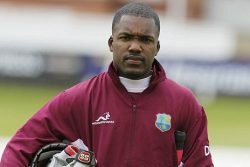 PORT OF SPAIN, Trinidad, CMC – In-form left-hander Darren Bravo says Trinidad and Tobago will not be relaxing for the second phase of the Caribbean Twenty20 starting in St Lucia Tuesday, despite topping the standings at the end of the first leg here Saturday night. PORT OF SPAIN, Trinidad, CMC – Windward Islands eliminated Leeward Islands from the Caribbean Twenty20 when they dealt the struggling side their fourth straight defeat here today. HOBART, Tasmania, CMC – Kemar Roach’s Brisbane Heat booked their spot in the Australian Big Bash semi-finals on Saturday with a crushing eight-wicket win over Hobart Hurricanes. PORT OF SPAIN, Trinidad, CMC – A spectacular Derone Davis hat-trick triggered yet another humiliating Barbados batting meltdown as Combined Campuses and Colleges hauled themselves off the bottom of the Caribbean Twenty20 standings with a sensational win here Friday night. PORT OF SPAIN, Trinidad, CMC – Jamaica edged Leeward Islands in a nail-biter, pulling off an exciting win via the super-over to move into contention for a playoff spot in the Caribbean Twenty20 here Friday night. PORT OF SPAIN, Trinidad, CMC – Veteran West Indies left-hander Shiv Chanderpaul says he is champing at the bit for Guyana’s showdown with Trinidad and Tobago in the Caribbean Twenty20 on Saturday night. (WICB) Port-of-Spain, Trinidad – Steven Jacobs had a major say in the outcome of Thursday night’s Caribbean T20 contest, bowling Guyana to a big win over Barbados in a low-scoring affair. 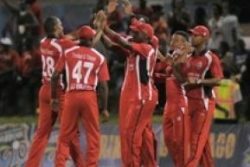 PORT-OF-SPAIN, Trinidad, CMC-A much-anticipated top-of-the-table clash between defending champions Trinidad and Tobago and arch-rivals Guyana will be played to a packed Queen’s Park Oval when the Caribbean T20 tournament climaxes its Port-of-Spain leg on Saturday night. PORT ELIZABETH, South Africa, (Reuters) – Hashim Amla plundered yet another century to lead South Africa to a commanding 325 for four on the first day of the second and final test against New Zealand at St George’s Park today. DERBYSHIRE, United Kingdom, CMC-Veteran West Indies middle order batsman, Shivnarine Chanderpaul, has signed a two-year contract to play for English county side Derbyshire. PORT OF SPAIN, Trinidad, CMC – Trinidad and Tobago brushed aside a ragged Combined Campuses and Colleges by seven wickets to register their first win and get their Caribbean Twenty20 campaign up and running here Tuesday night. MELBOURNE, Australia, CMC- Chris Gayle emerged from a run drought to hit a record half century but the Sydney Thunder squandered his heroics and succumbed to a 13 run loss against the Melbourne Stars in the Australian Big Bash League Tuesday. 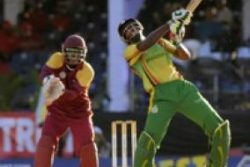 PORT OF SPAIN, Trinidad, Jan 8, CMC – A sloppy final over from beanpole seamer Jason Holder gifted Guyana a dramatic last-ball win over Combined Campuses and Colleges in the Caribbean Twenty20 here last night. PORT OF SPAIN, Trinidad, CMC – Barbados made light work of Leeward Islands, romping to an emphatic nine-wicket win to send an early warning in the 2013 edition of the Caribbean Twenty20 here today. 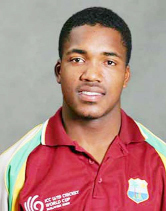 MELBOURNE, Australia (CMC) — West Indies all-rounder Marlon Samuels has been charged with two offences following his ugly clash with Shane Warne during a match between Melbourne Renegades and Melbourne Stars in the Australian Big Bash league on Sunday. PORT OF SPAIN, Trinidad, CMC – Trinidad and Tobago and Jamaica played to a no result in the opening match of the Caribbean Twenty20 at Queen’s Park Oval here yesterday. PORT OF SPAIN, Trinidad, CMC – Trinidad and Tobago and Jamaica played to a no result in the opening match of the Caribbean Twenty20 at Queen’s Park Oval here Sunday. MELBOURNE, (Reuters) – Shane Warne has been fined A$4,500 ($4,700) and banned for one game after a heated row with Marlon Samuels in a match in Australia’s domestic Twenty20 competition on Sunday night ended up with bats and balls being thrown. MELBOURNE, Australia, CMC – A nasty on-field confrontation with star Australian leg-spinner Shane Warne today plunged West Indies all-rounder Marlon Samuels into controversy yet again. 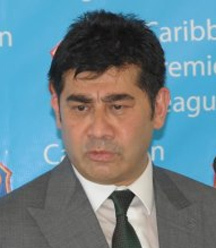 (Barbados Nation) Julian Hunte is about to pull stumps on his tenure as West Indies Cricket Board (WICB) president. SYDNEY, (Reuters) – Michael Hussey ended his test career on a high today when Australia beat Sri Lanka by five wickets with a day to spare in the third test to sweep the series 3-0. PERTH, Australia, CMC-Chris Gayle’s horror tournament continues as his Sydney Thunders laboured through another dismal performance, crashing to a 9 wicket defeat to the Perth Scorchers in the Australian Big bash League today. 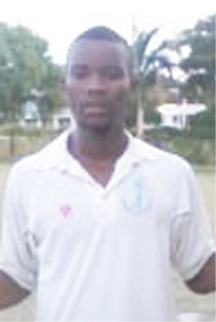 (WICB) Port-of-Spain, Trinidad – As vice captain and main all rounder, Christopher Barnwell sees himself as having a major role to play in Guyana’s line-up for the Caribbean T20 2013. (BBC) Opener Nasir Jamshed struck his second successive century to help Pakistan to an 85-run win over India in the second one-day international in Kolkata. MELBOURNE, (Reuters) – A last-gasp victory over Sri Lanka in Hobart gave Australia a sorely needed boost after disappointment against South Africa, but a mounting injury toll has tempered the hosts’ Christmas cheer in the lead-up to the second test in Melbourne. EAST LONDON, South Africa, (Reuters) – A brilliant, unbeaten century from opener Martin Guptill led New Zealand to an eight-wicket victory off the final ball against South Africa in the second T20 international on Sunday. MELBOURNE, (Reuters) – Spin great Muttiah Muralitharan has heaped more pressure on Australia’s under-fire Nathan Lyon ahead of the second test against Sri Lanka, saying the struggling off-spinner cannot even take wickets when pitch conditions favour him. As the outline of Twenty20 Caribbean Premier League was revealed last week, Julian Hunte reacted with the delight of someone opening a special Christmas present. 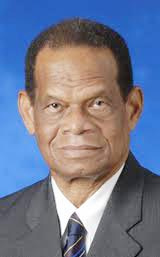 President of the West Indies Cricket Board (WICB) Julian Hunte has written to the Territorial Boards (TB) expressing concern over what he considers to be a recent attack on the WICB and over the fact that the legitimacy of the WICB seems to be under question. West Indies Cricket Board (WICB) president Julian Hunte has once again expressed his concern with respect to Guyana’s cricket situation. Test cricket: Pinnacle or sacrificial lamb? FOUR YEARS ago, when the idea that Test cricket should be split into two divisions was gaining currency, there was no doubt which one the West Indies would be in. ST. JOHN’S, Antigua, CMC – Trinidad and Tobago edged Martinique on penalties in a dramatic semi-final to book their spot in today’s final of the CFU Caribbean Cup. BRIDGETOWN, Barbados, CMC – West Indies Women’s captain Merissa Aguilleira says she wants to see fearlessness from her charges, as the side gears up for the home series against South Africa and the ICC World Cup in India next month. DUBAI, United Arab Emirates, CMC – Off-spinner Sunil Narine and talismanic opener Chris Gayle have suffered contrasting fortunes in the latest International Cricket Council’s one-day player rankings released yesterday. (BBC) England wrapped up a seven-wicket victory on day five yesterday of the third Test to take a 2-1 lead and move close to a first series win in India since 1985. Police Sports Club face resurgent Third Class By Neil Barry Jr., When the Georgetown Cricket Association (GCA) Noble House Seafoods-sponsored second division two-day competition continues this morning with four matches at various venues in the city, the Zone `A’ encounter between Third Class and the Police Sports Club at the Camp Ayanganna ground is expected to steal the spotlight. 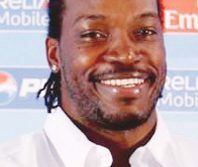 DHAKA, (Reuters) – The return of Chris Gayle and experience of Shivnarine Chanderpaul should give West Indies the edge in their test series in Bangladesh, the touring side’s captain Darren Sammy said day. COLOMBO, (Reuters) – Sri Lanka captain Mahela Jayawardene played down the Chris Gayle factor in today’s World Twenty20 final saying the West Indies team was not just about the swashbuckling opener from Jamaica. Two days after being told that they would no longer participate in the West Indies Cricket Board (WICB) Regional Twenty20 tournament and one day after learning that they would be replaced by a WICB `B’ team, the Amazon Conquerors as the national T20 team is known found themselves back in the competition. PORT OF SPAIN, Trinidad, CMC – Out-of-favour West Indies all-rounder Dwayne Bravo has warned of more runs to come from his younger brother Darren Bravo. 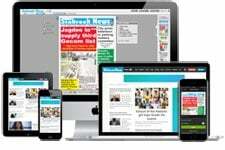 DHAKA, Bangladesh, CMC – A thrilled West Indies Women’s captain Merissa Aguilleira said Saturday she was pleased with the way her side had executed in playing unbeaten to win the ICC Women’s World Cup qualifying tournament. (WICB) Georgetown, Guyana – The West Indies Cricket Board today announced another exciting feature of the Regional Super50.